Hadleigh Rectory built 1856 in Victorian Gothic style. The deck chair adds a homely touch! WHO WAS THE RESTORER ? Lincoln College provided Hadleigh with a new Rector in 1853. He was the Rev Thomas Espinelle Espin, another Lincoln Fellow, who at the time of his installation at Hadleigh was 29 years old. He appears to have set to work with a will. In his time he had the church roof and chancel restored and provided several new painted windows and an organ. 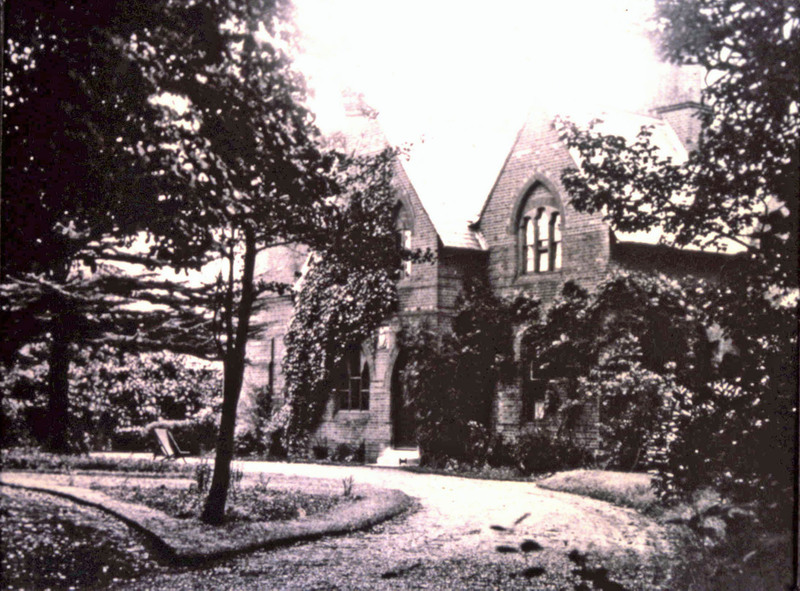 In 1856, a new Rectory arose slightly to the east of the old one. Espin had proved a generous man but the Rectory was charged to the living to the tune of £2000. Thomas was the eldest son of William Espin, a gentleman of Louth in Lincolnshire. His brother John was also a cleric who emigrated to South Africa. In 1854 Thomas married Eliza Jessop and they had a son, Thomas, who became Vicar of Tow Law, Durham, for 46 years but, as a Fellow of the Royal Astronomical Society, was better known in the world of astronomy, having a crater on the moon named after him. Rev Espin became an important figure in a variety of additional posts and responsibilities. He was heavily involved in the Society for the Propagation of the Gospels in Foreign Parts, becoming the Organising Secretary to the Archdeaconry of Essex. He attended meetings all over Essex, including Southend, Ongar, Chelmsford, Colchester, Maldon, Stratford and West Ham. The society was very much concerned with missionary work. Whether Thomas had done any such work is not clear but Essex newspapers report that he gave more than one talk on China and the Chinese. We also know from a letter to the Chelmsford Chronicle that he was abroad for a month in 1856 but where he went is not disclosed. For a period he served on the Essex Diocesan Board of Education and became a Diocesan Inspector of Schools. The previous paragraph tells of a man who is perhaps ambitious and who had to spend some time away from his flock. Certainly he was an enthusiast and a strong believer in education for all. Nevertheless, it is also quite clear that Hadleigh parish was an important aspect of his life. A Chelmsford Chronicle article in April 1856 includes a quotation from a letter written by Espin to Rev. Mitchell, an H.M. Inspector of schools. It was quoted without permission from Espin and he complained about this in the following week`s edition. However, it is worth printing in full here as it reveals the problems faced by Espin when he first arrived. Rev. Espin`s irritated response to the unauthorised use of his words is justified. He wished the inspector to understand that the children had not had the benefit of the educational opportunities they should have had and therefore the inspector should not expect too high a standard from them yet. He speaks of “disadvantageous circumstances”. He goes on to say, “…although some who have an interest in the parish have not done their share, others have contributed liberally, towards the erection of new school buildings.”(2) Although Mrs Lovibond, some 28 years earlier, had been generous in providing for a school in the first place and Lady Olivia Sparrow had recently given land for the new National School it is clear that the Rector had a way with him in persuading people to provide money and support for his new broom. He was also a man with increasing contacts and influence. The ruined rectory was a complete disaster. The remaining materials were sold for £10. He now had to foot a bill for a new design and its building. He managed to borrow £900 from Queen Anne`s Bounty, the fund to assist the incomes of poor clergy. Next he persuaded Lincoln College to vote him £400, by four annual payments and a further £100 towards the erection of farm buildings on the Hadleigh glebe land attached to the rectory. The architect of the Rectory was George Edmund Street who also advised on the re-roofing of St James and designed the Hadleigh Church of England School [now Sandcastles Nursery]. Street was in the early years of his distinguished career and devoted to the gothic revival which culminated in his design of The Royal Courts of Justice in The Strand. A close look at the original school building mainly hidden behind a later front addition reveals rich red brick and church-like narrow windows. Such a building must have been quite a shock to many of the inhabitants of Hadleigh where the largest buildings were either firmly in the tidy classical Georgian style or were ancient old farmhouses. THE FIRM HAND: Parish affairs were run by the Vestry who generally consisted of the Rector, the Churchwardens and other elected officers of the parish and local landowners. Despite the problems in Rev Mavor`s time the vestry meetings were held regularly and minutes were kept. The vestry Minute book does, however, reveal that from 1853 with the arrival of Thomas Espin the minutes take on a greater formality and are generally considerably lengthier. This indicates a firmer hand at the tiller and a concern to do things properly and carefully. Espin left Hadleigh in 1868. In his time he had overseen the recovery of the church and parish in Hadleigh with a devotion and practicality which had been sadly lacking in his predecessor. He became Rector of Wallasey 1868-1885 where his career developed further as an Honorary Canon of Chester Cathedral 1871, Chancellor of the Cathedral 1873 and eventually Chancellor of the Diocese of Liverpool 1880. 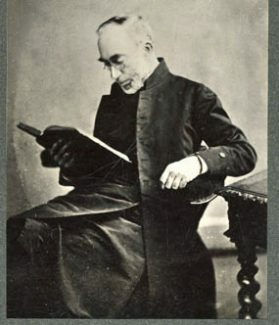 He retired to a quieter life as Rector of Wolsingham, Durham in 1885. Here he lived until he died aged 88. It is difficult to imagine two more opposite characters, lives and fortunes than the two successive Hadleigh rectors. John Mavor and Thomas Espin. Acknowledgement: the author is most grateful for the generous assistance of Andrew Mussell, the archivist of Lincoln College, Oxford. Additional note: Lincoln College owned the advowson of St James the Less for only 59 years, purchasing it for £1,400 in 1808 and selling it in 1867 for £2,800. Further details of Lincoln College`s ownership of the advowson and the life of the Fellows of the College may be discovered in The Commonwealth of Lincoln College 1427-1977 by Vivian H.H. Green, OUP 1979.